There have been few shorter major league careers, but minor league lifers would surrender a fortune to have had Walt Kellner’s cup-of-coffee experience. Kellner’s short stay in the majors was preceded by boundless expectations appended to the hard-throwing right-handed hurler. Most of those forecasts were rose-colored projections based on the 1949 rookie success of Walt’s older brother, Alex. A blazing fastball alone does not render a successful big league career. Indeed, Kellner’s minor league numbers would not have merited a major league promotion had it not been for the star-studded assumptions surrounding his surname. Kellner’s last major league appearance came 371 days after his debut. He garnered no decisions and a 6.43 ERA in seven innings. Far more was forecast for the hurler whose namesake was Hall of Famer Walter Johnson. Walter Joseph Kellner was born on April 26, 1929, the last of three sons (four children) of John Justus and Julietta (Garcia) Kellner, in Tucson, Arizona. His paternal great-grandfather, Johann Justus Kellner, a German immigrant, had arrived in central Texas in 1845. The family gravitated to the Arizona Territory around the turn of the century. As a child, Walt’s father reportedly came face-to-face with Pancho Villa when the Mexican revolutionary ventured into the then-small city of Tucson. After serving in World War I, John Kellner carved a long career as a cattle rancher and newspaper stenographer. But he possessed an earlier aptitude as well. In the 1920s John pitched in the Copper State League1 and tossed a no-hitter in Tucson’s Randolph Park (later Hi Corbett Field). John married Julietta, a Mexican native, and raised their family on a 25-acre ranch at the foothills of the Catalina Mountains (seven miles north of Tucson). But John’s passion for baseball remained constant as demonstrated by the given names of his second and third sons, honoring pitching greats Grover Cleveland Alexander and Walter Johnson, respectively. He instructed his sons at baseball, lessons that included throwing accuracy by hurling tennis balls through a drain pipe on the ranch. The tutelage was soaked up by all of his athletically gifted sons (the oldest brother, John, Jr., found success on the gridiron). The children attended Amphitheater High School where Walt played baseball and football. His prowess in the former earned an athletic scholarship to the hometown University of Arizona where he had a brief but successful stint with the Wildcats. Around this time Kellner also played semi-pro ball.2 In 1949, the same year his brother was constructing a 20-win rookie campaign with the Philadelphia Athletics, Walt earned selection to the National Semi-Pro All Star team. Throughout Kellner’s life, Alex, five years his senior, had a major effect on his younger brother. As major league scouts hovered around the Wildcats’ ball fields, Alex appears to have used his influence with scout Tink Turner to sign Walt to a Philadelphia contract on October 28, 1949. A former pitcher who made one major league appearance in 1915, Turner’s scouting territory did not include the Southwest. He had signed Alex in 1947 after seemingly stumbling on him during World War II when the left-hander was playing for a military base in Norfolk, Virginia. It appears likely Alex alerted Turner to his brother’s exploits. Before he threw a pitch in the professional ranks, Kellner’s signing had an immediate effect on the parent club. During the 1949-1950 offseason, the Athletics sought to bolster an aging outfield. They aggressively pursued right-handed hitter Hoot Evers by dangling some of the club’s competent young hurlers3 before the Detroit Tigers. Positioned to trade from strength, the Athletics were confident in their ability to replace any pitcher from among a foursome of highly-touted prospects that included Kellner.4 Though the Evers trade was never executed, the speculation surrounding the Tucson-native spoke volumes to the club’s high expectations in the righty. But after a promising April 22 win for the Lincoln (Nebraska) A’s in the Western League (Class A), Walt followed with 11 straight losses (a league record) that mercifully halted on August 13 with an 8-1 win over the Pueblo Dodgers. Two of the losses were by heartbreaking 1-0 scores as the club provided no support (the A’s were last in the league in runs scored). The losses continued as Kellner finished with a league-low .176 winning percentage (3-14).7 In the offensively explosive circuit Kellner’s 5.70 ERA was ordinary. The 21-year-old struggled with control as he placed among the league leaders in walks per nine innings ratio (6.1). In September 1950, shortly after the Western League season ended, Kellner enlisted in the US Air Force. In the spring of 1951 he was told to report to the Davis-Monthan base in Tucson. Little is known about Kellner’s 15-month service except that he pitched and coached for the military base. He mowed down opponents with ease, a fact that did not go unnoticed in Philadelphia. 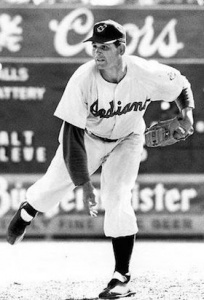 On September 6, 1952, ten days after his August 27 release (and without having thrown a meaningful pitch in two years), Kellner made his major league debut. Unlike his brother, a holdout until late spring, Kellner was signed to a 1953 contract before January. Disappointment followed when an undistinguished stint in the Florida training camp resulted in Kellner’s assignment to the Eastern League (Class A). In many ways the Williamsport, Pennsylvania, affiliate resembled the Lincoln squad from three years earlier. A slightly better offense was countered by a leaky defense (second in the league with 245 errors) to cause the club to limp to a 65-85 season. In a career-high 37 appearances Kellner managed a league-middling 4.50 ERA as he suffered another 14-loss season. An improved walk yield was offset by the surrender of a near league leading 14 home runs and 82 earned runs. Once again the Athletics remained unfazed as they tapped Kellner for a late-season call up. On September 9 Kellner tossed two shutout innings in relief against the Tigers, wiggling out of trouble despite three walks. He was not as successful against the Chicago White Sox two days later. A walk, hit batsman, and a steal of home contributed to two runs in one inning of work. When Kellner walked off the Connie Mack Stadium grass he had no way of knowing it was his final appearance as a major leaguer. He packed his bags for the long drive to Tucson alongside his brother. The final nail in Kellner’s big league aspirations came in Lakeland, Florida, on March 7, 1954. Pounded by the host Tigers for six runs in one inning, he was immediately optioned to Class AAA Ottawa. A league-leading 12 losses at mid-season prompted Kellner’s demotion to Class A where, on September 3, he led Savannah to a 5-1 win over the Macon Peaches in the South Atlantic League’s semi-finals. Less success ensued in the finals four days later when Kellner, locked in a pitching duel against the Jacksonville Braves, fell to defeat after surrendering an eighth-inning homer. At no point during the year was there evidence of the Athletics considering another promotion for the hard-throwing righty. By 1955 the Kellner name no longer evoked its prior excitement. Following his tremendous rookie campaign, Alex suffered through five consecutive losing seasons. His biggest champion – and by extension Walt’s largest proponent – had been Connie Mack. When the Athletics were sold and moved to Kansas City, Mack had been out of the picture for four years. The expectations appended to the Kellners among the scribes and fan base in Philadelphia did not exist in Kansas City. Within three years the brothers would be scattered to different locales. Walt was the first to depart. Following an unimpressive last campaign in the Athletics’ system in 1955, Kellner bounced among four organizations over the next three years. In 1957 he surfaced in the sports pages when Peanuts Lowrey, the New Orleans Pelicans’ manager, mistakenly omitted his starting pitcher from the lineup card in Birmingham, Alabama. The ensuing confusion forced Lowrey to select another pitcher to face the first batter before bringing Kellner into the game. Absent-minded skippers were not the only challenges. The Pelicans’ bandbox stadium led to Kellner’s surrender of a career-high 22 home runs in 1958. “[T]his is where we have to play, so all you have to do is make the best of it,” he stoically offered. “If anything, it makes you more careful with your pitches.”11 Kellner garnered just four wins against 10 losses before a July transfer to the Texas League. One of those wins evidenced the potential once spied when the righty received notice for his “gritty pitching”12 in a 9-5 win over Atlanta that ended the Crackers’ eight-game win streak. But at 29, Kellner came to the realization that his hopes of returning to the majors had ended. Following the 1958 season he retired from professional baseball. Kellner returned to Tucson where, around 1960, he and his brother found longtime employment in construction. The two also shared a passion for hunting, including the unique pursuit of capturing mountain lions and bears for sale to zoos and circuses. Kellner kept a close tab on baseball. He spent over 17 years coaching from the Little League ball fields to the local Pony League and semi-pro circuits. The instruction paid off with his own sons. In 1980 Walter J. (“Joe”) Kellner was a pitcher for the University of Arizona NCAA championship team. Ten years later Frank Kellner launched an eight-year minor league career with the Houston Astros.13 In the late 1990s Kellner had an opportunity to relive his own exploits when attending a reunion of the Philadelphia Athletics Historical Society where he interacted with fans and former teammates. On June 19, 2006, slightly more than 10 years after his brother’s passing, Walt Kellner died. He was survived by his wife, Shirley, two sons and two daughters, Kathryn and Martha. Kellner’s career never approached that of his namesake Walter Johnson or, for that matter, his brother. But evidenced by the way he is remembered in Tucson years after his passing, combined with the welcome he received in Philadelphia during the Athletics’ reunion, Kellner will not soon be forgotten. 1 Another source indicates he played in the Arizona-Texas League. 2 These pursuits likely began in 1946 alongside Alex Kellner, who briefly forsook the professional ranks to play in the semi-pro circuit around Tucson. 3 In 1949 the Athletics possessed the youngest staff in the majors. 4 The other prospects were Arnie Portocarrero, Angelo Nardella and Bob Hooper. 5 Lacking a proper inspection sticker the pair was stopped twice in route by Pennsylvania highway patrolmen. 6 “Bunts and Boots,” The Sporting News, March 8, 1950, 23. 7 Another source indicates Kellner collected eight wins. 8 “Submariner Among New Tossers Getting Late-Season Trials as A’s,” The Sporting News, September 17, 1952, 5. 9 “Art Ehlers’ Christmas Forecast – Flag in ’53,” The Sporting News, December 17, 1952, 5. 10 The other pairings include Matt and Michael Kilroy with Baltimore in 1888; Frank and John Foreman with Cincinnati in 1896; Grover and Louis Lowdermilk with the St. Louis Cardinals in 1911; Vean and Dave Gregg with Cleveland in 1913; Dennis and Dave Bennett with Philadelphia in 1964; and Mickey and Rick Mahler with Atlanta in 1979. 11 “Pell Park Even Bigger HR Haven Than L.A. Coliseum,” The Sporting News, May 7, 1958, 37. 12 “Crax Eight-Game Skein Cracked,” The Sporting News, June 4, 1958, 31. 13 From 2006 through 2015 Frank served as the assistant baseball coach for Temple (Texas) College.